Today has been somewhat trying! The wind, that which we think of as foe, made its presence felt this morning. The forecast was for even windier conditions in the afternoon so we decided to bite the bullet and put up the tent ready for when the kids arrive. To say it was a test of our strength, patience and marital harmony is an understatement. 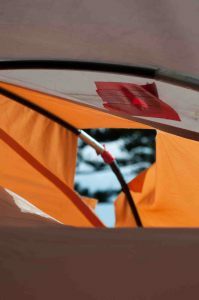 The wind whipped the tent and made it difficult to keep on the ground, the poles kept popping out and Pat had a nasty confrontation with one and is now sporting a scratch on his door. There were a few muttered swear words and a distinct “I despise this tent”. We both had ideas of the best way to get the dratted thing up and neither of us had enough arms and hands to hold everything down. Eventually the job was done but one of the guy ropes tore and there was also a small rip in the top of the fly. Needle and thread attached the wayward guy rope and red sticky tape patched the hole. Would it hold? The answer of course is no. The guy rope tore in another place (not the bit I stitched up I hasten to add) and the gusts of wind blew the tent to a 45 degree angle. It strained already taut and fragile poles, ropes and material. 32 degrees suddenly became 22 and the wind whipped from North to South West. 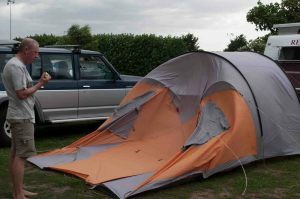 The tent looked kind of funny and we realized the back had collapsed – another guy rope broken. Then part of a pole threatened to pop another hole in the fly. The red tape came out again, unfortunately the attempt to prevent damage actually resulted in a big rip. At this point we gave up, wrote the tent off as a lost cause and began to think of possible alternatives – just how many can we squeeze into the van, where and how? Maybe Zac and Jan can sleep in the car? As I write the tent is still standing, well blowing in the wind. The shower of rain doesn’t seem to have made the inside wet. If the wind dies down later we could put a tarp over the tent to keep the forecast showers out. It may not be a total lost cause after all. It might have one last hurray left in it. Oh and besides our stuff blowing all over the place (not sure If I lost stuff off the clothes line, hopefully the stuff I picked up off the ground was all there was) Colin sat down in his chair to take a well earned rest and it split – so that’s the end of that.